Knowledge Base. : BOOK : Who Moved My Cheese? This timeless allegory reveals profound truths to individuals and organizations dealing with change. We each live in a "Maze", a metaphor for the companies or organizations we work with, the communities we live in, the families we love places where we look for the things we want in life, "Cheese". It may be an enjoyable career, loving relationships, wealth, or spiritual peace of mind. With time and experience, one character eventually succeeds and even prospers from the change in his "Maze".In an effort to share what he has learned along the way, he records his personal discoveries on the maze walls, the "Handwriting on the Wall". Likewise, when we begin to see the "writing on the wall", we discover the simplicity and necessity of adapting to change. 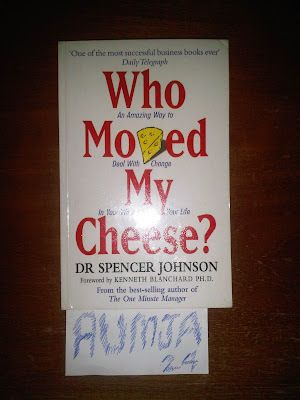 Full of modern day insight, the story of Who Moved My Cheese? invites individuals and organizations to enjoy less stress and more success by learning to deal with the inevitable change.